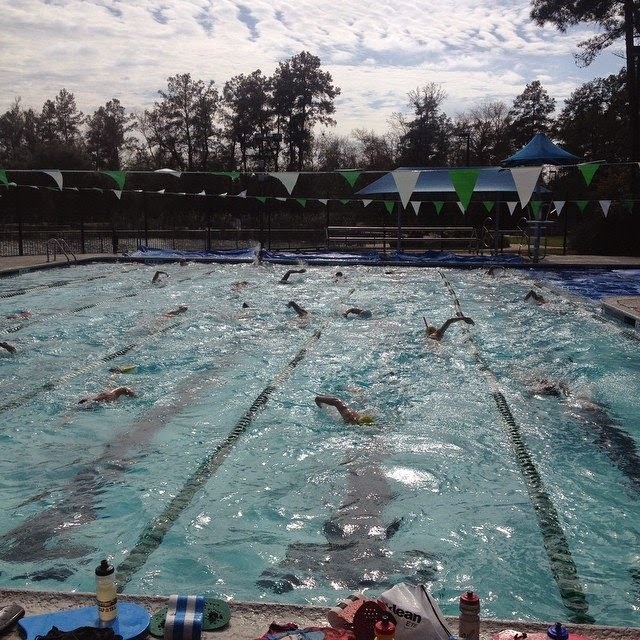 There are plenty of triathlon coaches who coach swimming, and swim coaches who coach triathletes, but Tim Floyd of Magnolia Masters occupies a unique and specialized niche as a triathlon swim coach. He has made a careful study of the most effective methods to apply to triathletes of all levels. He has enjoyed great success with beginners, weekend warriors and professionals alike, who all share the pool at Magnolia Masters practices. Many aspects of Tim’s coaching philosophy differ markedly from the prevailing dogma of triathlon swimming. Coach Tim reached out to me after seeing my “critique my swim” thread on Slowtwitch.com last January. 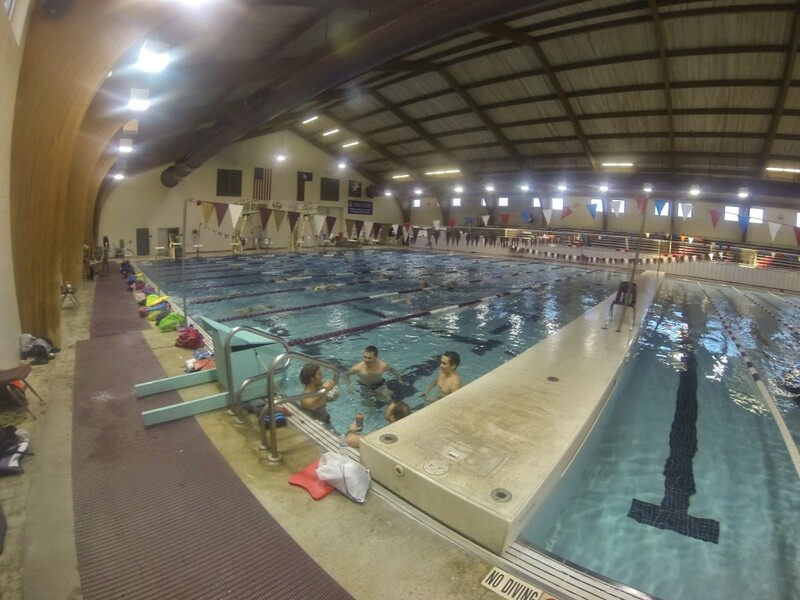 I was a solid swimmer as an age group triathlete, but I knew that my swimming would be a liability when I stepped up to the pro level last year. He quickly convinced me that he could help me improve, even though we were a country apart in Ontario and Texas. Tim is able to accomplish a lot via remote coaching with daily communication. However, he is the first to admit that there is no substitute for being on deck. 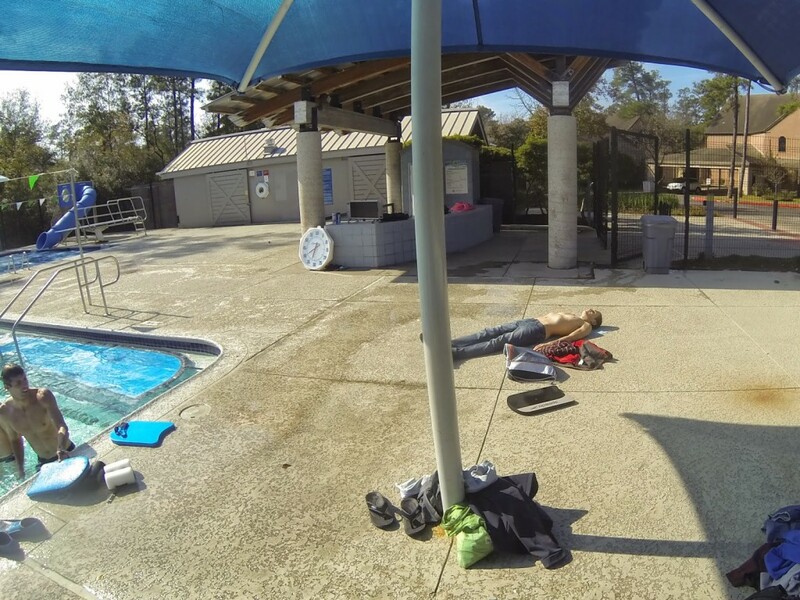 This January, he invited me to his base in The Woodlands, Texas for a month-long swim training camp with several other pro triathletes. Sharing lanes with three Ironman Champions and a repeat US Open Water Swimming Champion, and swimming up to 10 practices and 43,000 yards per week made for an inspiring, humbling and productive month. Read on for some key lessons I learned over the past year with Magnolia Masters, punctuated by some quotes from Coach Tim, and photos and videos from the camp. There’s also a word on my progress at the end. 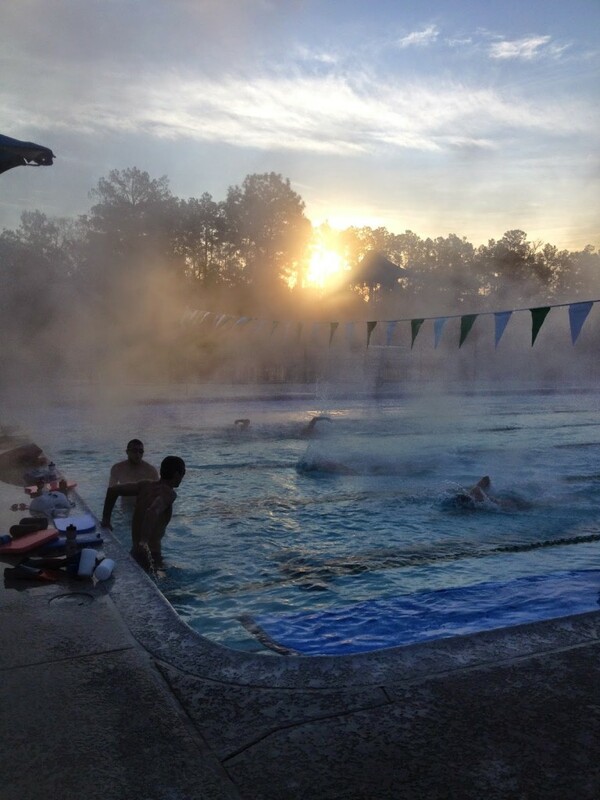 Morning practices at the Creekwood Pool provided a stunning backdrop to our suffering. Technique and training are inseparable. A commonly held view among triathletes seems to be that “technique” and “training” are independent components of swimming that can be developed in isolation. When I first began working with Tim, I was hopeful that he would identify a few technical flaws, assign a few drills, wave his magic wand and I would be a front pack swimmer in no time flat… If only it worked that way. Tim certainly does stroke analysis sessions and provides technical pointers from the deck at every practice, but his use of direct stroke correction and drills is targeted and sparse. Tim drives efficiency into the stroke primarily through a heavy emphasis on short, high intensity repeats which condition the swimmer to hold “technique under load”. There’s no escaping a lot of hard work. 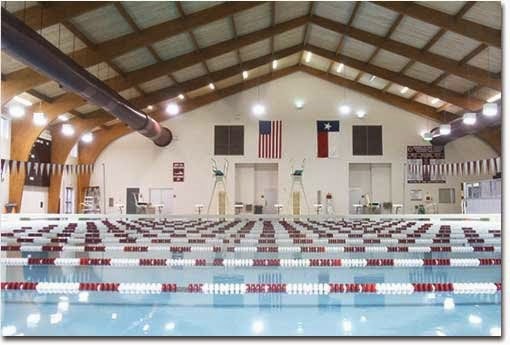 We split our time between this impressive indoor facility in Magnolia and an outdoor pool. Keep repeats short and sweet. Magnolia Masters practices emphasize short, high intensity repeats, usually 25-100 yards/meters. In fact, outside of races, I can count on one hand the number of times I’ve swum more than 200 hard without stopping. 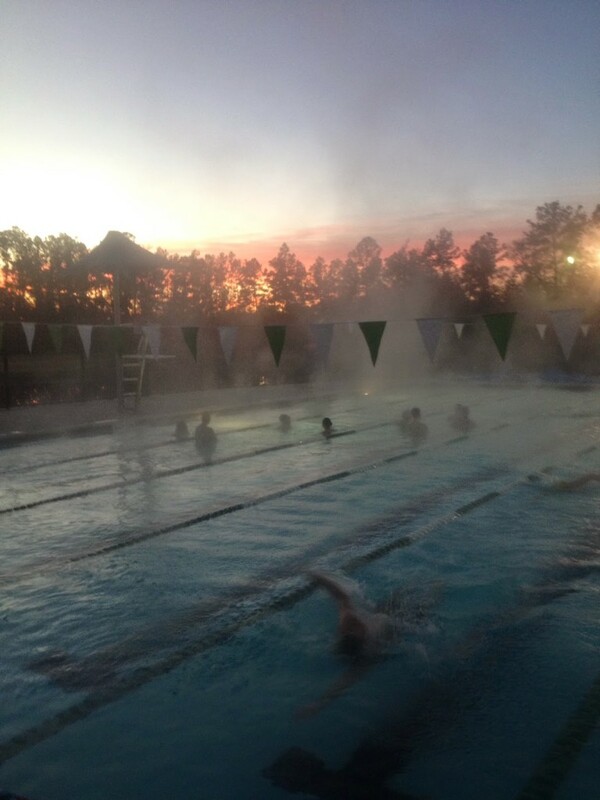 Every practice incorporates a least a little fast swimming. This approach contrasts with that of many triathlon swimmers and coaches, who often consider long, steady intervals necessary to prepare for a 750 to 3860 meter swim. Tim makes extensive use of a training technique known as ultra-short race-pace training (USRPT) adapted to triathletes, which he outlines here. A standard set is 15-30 × 100 holding a precise pace on a pace time that provides no more than 20 seconds rest. Typically, if you miss the hold pace once, you sit out the following repeat then resume the set. Miss a second one and the remainder of the set becomes active recovery. The pace clock is your power meter. Triathletes as a whole have generally embraced the use of data and technology applied to running and cycling, but this data-driven approach doesn’t always extend to swimming. With Magnolia Masters, every set is precisely structured and every repeat is quantified using the pace clock. Each swimmer’s times are recorded and analyzed for signs of fatigue and changes in fitness in much the same way that power meters have become an indispensable tool for cyclists. To dive even deeper into the data, Tim recently purchased a “power rack” for the team. Swimmers are tethered to the device, which pays out a length of cord applying progressively greater resistance. Power and speed are sampled at a high enough frequency to detect fluctuations throughout the stroke cycle. 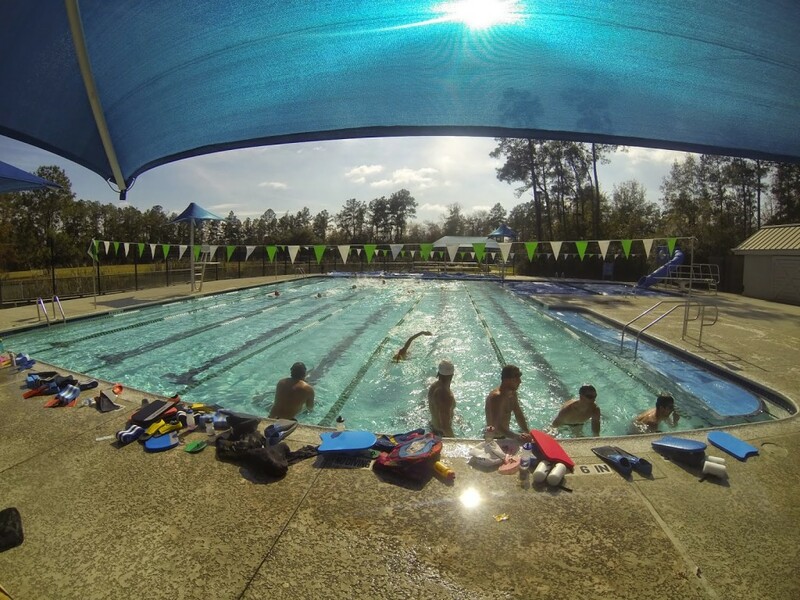 Swimmers of all levels were tested during the camp, from beginners to front pack professionals. Among other applications, this library of data will quantify the relationship between power and efficiency that corresponds to different levels of performance (e.g., a front pack pro, a sub-hour Ironman swim, etc.). – Swim leading Ironman pro, Balazs Csoke, on the new power rack. With snowstorms back home, I could sure get used to January in Texas. Focus on every single stroke. It’s taken me a long time to grasp that swimming is fundamentally different than triathlon’s other two disciplines, at least for those without an extensive swimming background. I can’t afford to zone out like I can while running and cycling. I need to be present and focused every minute to make progress. My best and hardest sessions are equally mentally and physically taxing. I made the most of the Texas sunshine after Tim benched me for looking fatigued one practice. I’m quite happy to put in long hours running and cycling with only my thoughts for company. I pride myself in my ability to push really hard when no one else is watching. Even so, the presence of other swimmers and a coach on deck has a remarkable effect on my swimming. Tim estimates that swimming alone costs his remote athletes about 5-10% of their potential performance if they swam with the team on a regular basis. Part of this benefit is the camaraderie and friendly rivalry of the team atmosphere. The coach also deserves a lot of credit. As you are gasping on the wall between repeats, Tim has a masterful ability to deliver the perfect word of encouragement, kick in the pants, or sometimes just a meaningful look that motivates you to get the most out of yourself. When I began working with Magnolia Masters one year ago, my all-out 100 yard sprint from a push was 1:05. By the first week of camp, I was holding ~1:05 for long sets (e.g., 20 × 100 @ 1:25) and sprinting ~1:01. By the end of the camp, I was holding 1:02-3 for long sets and sprinting :59. This still puts me a few seconds per 100 behind the top swimmers in long course triathlon (like campers John Kenny and Balazs Csoke), but with continued hard work, I should be within striking distance of typical front pro packs. For more insight into the Magnolia Masters approach, check out Coach Tim’s daily camp updates and the team’s Facebook page. One of the campers, Justin Daerr also interviewed Tim for an excellent podcast with Endurance Corner. Please join the conversation about this post on Facebook, Twitter or in the comments below. A full pool shared by pros and age groupers.